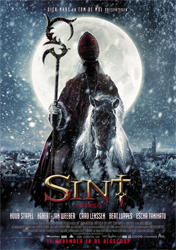 ‘Saint’ opens in 1492 with St. Nicholas and his band of dirty goons raiding a village and happily killing, maiming and stealing. The villages decide they don’t like this one bit, and promptly attack and set him on fire. Cut to 1968, it’s a full moon on the night of Sinterklaas and the murderous ghost of St. Nicholas along with his band of Black Petes attack and murder the family of a young boy. Jump to modern day and young Frank (Egbert-Jan Weeber) is secretly seeing a girl already in a relationship, Lisa (Caro Lenssen) and makes some money on the side dressing up as St. Nicholas for the annual December 5th celebration of Sinterklaas. The survivor of the 1968 attack is now a grizzled cop (Bert Luppes), he knows there’s another full moon coming and he’s certain that St. Nicholas and his horde will be arriving soon to hunt the innocent… especially the children. We kick off twelve days holiday weirdness with Saint, a horror comedy from the Netherlands that got a bit lost in the popularity of ‘Rare Exports’ (2010). Although the two prologues are genuinely exciting, once we get to modern day, there is a lot of waiting around, watching attractive young people do attractive young people things before we jump back into the mayhem. I kind of appreciate there is no reason given why Saint Nicholas is so evil, or what he wants other than to just kill as many people as possible. I also appreciate a movie where the horror and the humor never really intersect. It’s also interesting to see a holiday like Sinterklaas, that doesn’t get much (or any) play in movies that make it over here to the U.S. Seeing guys in black-face who are dressed up like Black Pete is pretty awkward, but it’s possible to just go with it, so you can get to the carnage.